The Fred Perrin Le Bowie is a fixed blade knife for you to carry on your person everyday or to use on your next hunt. 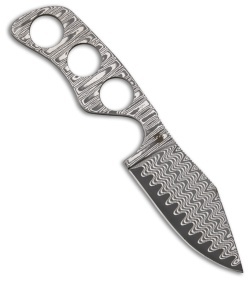 Damascus steel, clip point blade. Skeletonized tang handle is made of Damascus steel as well, and features an integrated guard and a drilled hole design. Black molded Kydex neck sheath is included and comes with a black beaded ball chain.